Well, if ever there were proof of the latter day dominance of Big Time Gaming in the high variance slot market, the Blueprint Gaming's Diamond Mine slot is surely it. The game is a licensed version of BTG's famous (or infamous!) Bonanza slot but there are one or two subtle differences in this version aside from the obvious aesthetic ones. 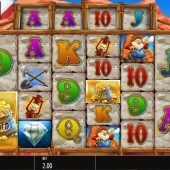 It joins a bunch of other popular slots in this theme, such as Aristocrat's Where's The Gold and Gold Rush from Pragmatic Play. The mechanic is the same 6-reel 'Megaways' format which means that reels 1 and 6 can display 2 to 7 symbols on a random basis during each spin while the centre 4 reels can display 2 to 6 icons. This is because there is a permanent bar of 4 scrolling symbols over these centre 4 reels and those are the only places you can see the slot's Wild appear. The reels stop with a random amount of rows in this range so each spin can offer anything from 324 to a maximum of 117,649 ways and as they all contain symbols stacked from single to 7 rows high the base game pays can be significant. When wins have been paid, the winning symbols disappear and replacement ones cascade down from above until no more winning combinations are formed, same as with Extra Chilli too. As with Bonanza slot we have a diamond as the top pay at 50x bet for a full 6-of-a-kind and even 2x bet for just two. The card values are the same but merely have different colours so the only significant changes are the equivalent of Bonanza's green, blue and red gems which here are represented by a Miner, Pickaxes and a Lamp. The theme is of the Californian Gold Rush though as opposed to Bonanza's Australian one and the Miner looks more like a garden gnome or one of Snow White's Seven Dwarfs and that is further augmented by the rather juvenile appearance of the game - perhaps it is made with the Scandinavian market in mind? If it were possible, the constant American-sounding banjo music is even more irritating than it is on Bonanza and the sadists have likewise made it impossible to silence it without turning the sounds off altogether. Okay, so that's a minus for the appearance and soundtrack but it goes without saying that the game's math model and mechanic is a huge and proven success and there is one quite significant difference which I alluded to in the introduction. On the Diamond Mine slot you can randomly see stacks of TNT Barrels overlaid on the reels from just one or two positions to stacks on 4 or more reels. These explode to reveal an identical symbol which may or may not help you get a large win, especially as they can be diamonds on occasion but not Wilds or scatters. Diamond Mine slot's feature involves getting 4 scatters for 12 free games where every single win increases the multiplier by 1 with no limit. You may see them drop straight in or the crucial gold stacks drop in after a cascade from above or even both which may yield up to 8 scatters in total. Each one over the 4 adds 5 extra spins and they can also appear on the scrolling symbols in the free games to add 5 extra spins for 3 or 10 for all 4. It's usually good to get a series of winning cascades right at the start so if you're lucky you can hit a 10x multiplier after just 3 or 4 spins. Given the large diamond pays possible or getting say 96 ways of a card value at this stage can award wins of thousands times bet just for that one free game. Theoretically wins of tens-of-thousands times are possible over any given bonus round. 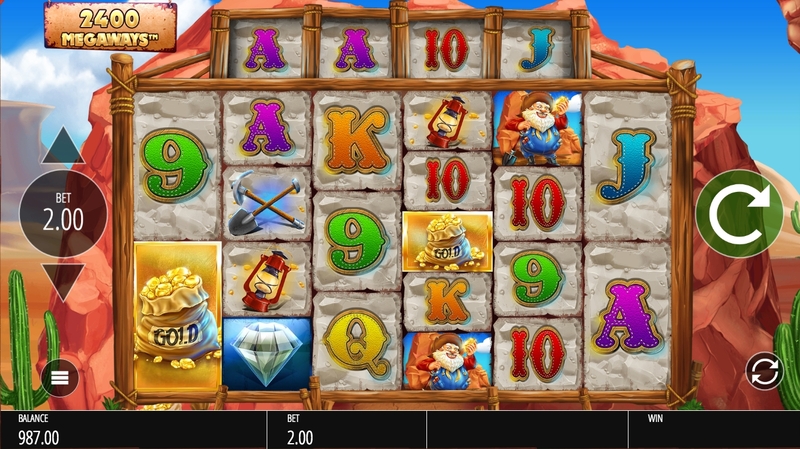 Diamond Mine slot cannot be faulted for design or mechanic as it's already a popular game in its original form. The mystery TNT Barrels are also quite important as they make the game's overall RTP 96.43% which is an improvement over Bonanza's 96.00%. There is one huge drawback which concerns me as an ardent fan of the original Bonanza though - the symbols are too hard to distinguish from each other and the appearance is a blurry mess as a result.